This paper makes several points about the use of EROI as an indicator of future potential. First, for comparability it is important to limit comparisons to specific end-use a products, such as gasoline for cars or electricity for the grid, or perhaps hydrogen for fuel cells. Comparisons between different end-uses are very dubious. Second, it is important to avoid comparing EROIs for fossil fuels stored by geochemical processes in the Earth’s crust vs nuclear power (based on a single element, uranium) vs technologies based on energy directly or indirectly from the sun. The EROI for nuclear power may increase 50-fold by the introduction of breeder reactors, while the EROI intermittent sources (wind and solar PV) may also increase by orders of magnitude in the future, as new energy storage technology is implemented. The EROI for intermittent sources (wind and solar PV) may increase radically in the future, as new energy storage technology is implemented. More generally, it is important to notice that, whereas increasing use of fossil fuels will reduce the EROI of what remains in the ground, the opposite is true for renewables. This is because the renewable technologies are at the beginning of their development, and have yet to enjoy all the benefits of scale and experience. When those benefits are taken into account the EROIs for renewables may be significantly greater than the current EROI for hydrocarbons. Inappropriate comparisons between fossil fuels and renewables, especially solar power, provides ammunition for climate “nay-sayers”, nuclear power advocates and advocates of “adjustment” to a warmer climate, who argue that renewables are just too expensive and that they can never “take over” from fossil fuels due to intermittency. That implication is unjustified for the simple reason that the comparison between EROI for fossil fuels and the EROI for “renewables” is faulty. The end of free energy and the coming of energy extraction as an industry. The acronym EROI stands for Energy Return on (Energy) Investment. It expresses the fact that primary energy needed to maintain an economic system must first be extracted from nature and converted unto useful forms. In short, it takes energy to “produce” energy (Hall 2008, Murphy and Hall 2010, Hall, Lambert, and Balogh 2014). The word energy should actually be replaced by the word exergy, as noted below. At this point, it is appropriate to comment briefly on the meaning of the word energy itself. The problem is that the word is over-used in ordinary language and, more often than not, it is used incorrectly, or at least in ways irrelevant to this discussion. It helps, perhaps, to speak of “useful” energy, to introduce an economic context, but the word “useful” is also ambiguous. It helps, to speak of “useful” in the sense of doing “useful work”, but the word “work” also conveys other meanings, especially “work” in the sense of employment (Ayres 2016) Chapter 1. So, in this paper “useful work” refers to physical activity such as lifting, initiating motion by pulling or pushing, or overcoming friction. Thermodynamics emerged from the historical evolution of steam engines for converting heat into useful work (pumping water out of coal mines). For precision it is helpful (useful?) to introduce a more technical term: exergy, along with its complement anergy. Exergy is defined as the component of energy that is able to do useful work (in the above sense) while anergy is the component of energy that cannot do useful work. Energy it the sum of exergy and energy. Moreover, the first law of thermodynamics is that energy is neither created nor destroyed i.e. energy is conserved. On the other hand, exergy is not conserved: exergy is destroyed (converted to anergy) in the process of doing work. For engineering and scientific purposes it is important to quantify this relationship. Here, too, it is appropriate to mention the famous “second law of thermodynamics, which basically says that the conversion of exergy to anergy is a one-way process. Whereas kinetic energy of motion can be converted 100% into heat, the reverse is not true. Heat can do some work, but as it does so, some of the potential to do work is lost (the Carnot law). In other words, energy becomes less useful as it is used to do work. This “energy degradation” process – as it might be termed – has been characterized by another technical term, entropy. As exergy is destroyed, entropy increases as anergy increases. But they are not the same. Anergy is a component of energy, whereas entropy is another thing (but not actually a thing). Entropy is a state of matter, that reflects its degree of disorganization and randomness. The technical difference between anergy and entropy is important for statistical mechanics, but fortunately it is not crucial for this paper. Returning to the main purpose of this discussion, another important kind of useful work (exergy) – arguably the most important of all for us humans as animals (and for all animals) – is the chemical work involved in carbon fixation (and oxygen generation) by photosynthesis. That chemical work, making glucose from carbon dioxide and water (with energy from sunlight) is done in the green leaves of plants by the organic catalyst called chlorophyll. The glucose is a store of chemical energy that can be converted back into mechanical work in muscles, by recombining with oxygen. That process is called respiration. However, while no human intervention is needed to induce green plants to produce glucose and oxygen, the plants will not harvest themselves. Apart from the unlikely case of an apple falling into the open mouth of a reclining philosopher, other energetic activities are needed to gather and convert the fruits, seeds and leaves of plants into edible foods or animal feeds. Again, while some domestic animals feed themselves (when not working), they do not milk themselves or deliver their eggs to the kitchen, still less voluntarily offer their bodies to be converted into steak or chicken nuggets. Humans survived for hundreds of thousands of years by hunting animals for meat and gathering nuts and fruits from wild plants. Both of those activities required energy, but the only energy that counted back then was food. When the free energy available to humans exceeded the energy required for its capture or production there is a surplus available to be used for other purposes. There was sometimes a surplus, after a successful hunt. For most of human history that surplus was used to support leisure activities like story-telling, games, physical training or fighting. The other purposes for which surplus energy may be used include saving for a “rainy day” (which might mean a future day when the rain would be inadequate). Other purposes also include the building of walls for protection or shelters against bad weather, tombs for the afterlife and financing of wars for conquest (or defense). Finally, and typically low on the priority list, would be the creation capital assets to enable greater energy production. Irrigation channels were one of those, but they could only be organized (and defended) by a very strong leader. Even lower on the priority list would be the diversion of wealth to finance learning or research. The conquest (or more accurately “capture” of fire was another big step, in that it enabled humans to utilize higher temperatures than metabolism or ordinary sunlight. The higher temperatures attainable by combustion of dead branches, or wood cut for the purpose, enabled the cooking of meat and plant products to make them easier to eat and digest. This improved the human diet and constituted a positive return on human energy expended, although not an overall positive EROI. It also enabled the creation of pottery and (later) the smelting of metals, which (still later) enabled the creation of metal tools like axes and plowshares. In terms of this discussion those innovations were enormously valuable for humans, but enormously wasteful of natural wealth. Fortunately, until the last glacial melt-off ten thousand or so years ago there was plenty of natural wealth available to be wasted (in relation to the number of humans). That changed as the human population grew and occupied more of the land. The age of hunting and gathering came to an end. The age of organized energy production, starting with agriculture began (but remained nameless). The acronym EROI stands for Energy Return on (Energy) Investment. It conveys the idea that energy is not really free for the taking. Even the hunters and gatherers had to expend energy in order to obtain energy in the form of game or fruits and nuts from the forest. They also had to invest energy in the gathering of wood for their fires. It is true that they did not (yet) have to pay for the animals they took or nuts they gathered, nor did they have to replace them. Not yet. The first indication that there were limits to free energy was probably when the melting of the last glaciers caused the sea levels to rise. Noah’s “flood” was how this event was converted into legend. The rising sea flooded – sometimes suddenly, when barriers broke — the most productive low-lying forest lands both south and north of the tropical rain-forests. This happened in what is now the Red Sea, the Mediterranean Littoral around the Black Sea, the Indus and Brahmaputra deltas, the Mekong and Yangtze deltas and in western China (Sinkiang). Tribes had to move inland and up-river and, in doing so, to displace the current residents (including the wild animals). For similar reasons, other tribes moved down the river valleys. Later, after the glaciers had melted, some of the productive upland forests dried out further and became grasslands. Populations, like the Mongols, learned to ride horses and to herd cattle. But as their uplands pastures suffered from periods of drought (as during the years after major volcanic eruptions), those tribes periodically needed to find better land (Keys 1999). Meanwhile agriculture emerged in the lowlands and valleys. But there was no more food surplus for a long time, as we know from the diminished skeletal remains of the farmers. For several thousand years only the river valleys with annual silt depositions, like the Nile, could support significant human populations. Forests in the temperate zones became scarce. But agriculture became more efficient and populations in the valleys increased. Meanwhile there were periodic incursions – immigrations — from the hungry uplands to the productive valleys. Weapons and military strategies evolved, as did walls and defenses. Some of the invaders became conquerors, others were defeated but their descendants integrated. City states, and nation-states emerged. Some tribes, like the Phoenicians, learned to sail ships and to colonize islands and more distant lands. Others, like the Romans, became professional soldiers living off their conquests. But “free” energy in the form of plentiful wild game or fruit-bearing trees became scarce as the land dried out, the deserts expanded and the forests (except around the equator) retreated. The notion of “net energy” was not yet understood, but its implications were becoming clear. In an agricultural society, there is no more “free” energy, at least for the population in general. What little hunting and gathering potential that remains is invariably monopolized by the leader (and generally for his amusement). For the rest, energy (i.e. food) for consumption had to be paid for, either in labor or with money. In fact, for the next several thousand years the concept of land ownership – in the sense of exclusive rights became established in law and custom. Agricultural lands were invariably owned by somebody. At first that might have been whoever settled on the land and lowed the first furrows. But over time, ownership was firmly established in law. And in recent centuries, most of the farm-land has been owned by members of an aristocracy, while the people who lived on the land, and did the work, no longer owned it, but had to pay the landowner a share of the crop, or a money rent. Markets, at first, were places where goods were exchanged, often by barter, for other goods. But long distance trade developed, both by land and by sea, and with it came money (as metal coins) with widely recognized value. With money came economists (notably the so-called physiocrats like Turgot and Quesnay) who believed that the wealth of nations was derived from their agriculture (the land) recognized the importance of trade and the need to balance inputs and outputs in the aggregate. They believed in high prices for agricultural products, low tariffs and free trade. Contemporaneously, Adam Smith argued that trade itself, based on manufacturing exports was true the creator of national wealth. One of the great distortion of long-distance trade arose because European countries treated gold and silver as coinage with intrinsic value, but exchangeable for products like tea and pepper, whereas Indians and Chinese accumulated precious metals for other purposes and did not use them in coins for trade. This resulted in a massive flow of gold and silver from West to East in exchange for consumables like spices and tea. Meanwhile European governments needed more of the precious metals to replace these losses, and most of all to pay their soldiers. The Spanish stole it from Mexico and Peru. The French got it from various places, such as North Africa (where it came north from the Niger River (now Ghana) in exchange for salt). The English got it by nationalizing the Churches (which had a lot of gold ornaments), by capturing Spanish treasure ships whenever possible, and by taxing their American colonists and demanding the taxes be paid in gold. Later they got it back from China by selling opium. Meanwhile, England after the 15th century there was massive deforestation, partly to feed a growing population, partly to provide ships for the navy and the merchant marine and partly to increase grazing land for sheep to serve the growing European market for wool. The days of free firewood were long gone. Firewood was a commercial product used to make charcoal, which was needed for high temperature furnaces to make glass, ceramics, and to smelt iron and copper. And the price of charcoal was rising. In the year 1709 Abraham Darby, an iron-monger Bristol, successfully used coke (made by preheating coal) to make cast iron products. He kept his process secret, but the word gradually spread. By the end of the century, coke had replaced charcoal for iron-smelting in Britain. Of course the rising demand for coal resulted in coal mines going deeper, where they encountered water and became flooded. Teams of horses were used to pump the water out of the mines. That changed when the first “atmospheric” steam engines were created to replace those teams of horses. (Hence the term “horsepower”). In 1712 the first successful steam engine was introduced by Thomas Newcomen. By 1775 well over a hundred Newcomen engines had been built and operated just in the Newcastle-on-Tyne area. But the James Watt’s development process, backed initially by Samuel Roebuck beginning in 1769, and later by Matthew Boulton (1775) continued until 1785 . At that point, the combined inventions of coking and Watt’s condensing steam engine for mines, made coal available as an essentially unlimited energy resource, for the first time in human history (Stern and Kander 2012). From a theoretical point of view, this means that energy availability was not a constraint on economic growth. The question of whether energy availability became a driver of growth – the question of causality – cannot be so clearly answered by econometric means (the data are not good enough). But the huge increase in the market for coal and its power carrier (steam), together with cheap iron, triggered the development of the steam-powered engine on iron rails. (Chemin de fer, in French). After 1830 the railroads cut the cost of land transportation massively, while seaborne transport followed soon after. This seems to be evidence enough. But steam power still drives much of the electric power generating industry. The arrival of coal as a virtually unlimited energy resource with steam engines as a power source, was followed a century later by the arrival of petroleum. This was another unlimited source of liquid fuels and it had an accompanying power source, the internal combustion engine ICE). That was pioneered by Nikolas Otto and successfully miniaturized by Gottlieb Daimler, who made a self-powered 4-wheel carriage. Karl Benz put the Daimler engine in his own carriage. They independently created the first successful automobiles and the world’s most important manufacturing industry. (They were not partners. Their companies merged in 1927). Other factors being, equal, mining companies or oil companies will tend to “skim the cream” i.e. they will exploit the richest deposits first, to recover their up-front investments as quickly as possible. However, discovery is somewhat unpredictable; the best deposit may not be discovered first. Note the “bunching” of super-giant oil fields. (See Figure 1). It seems highly probable, of course, that after exploration has been going on for some time, the “best” deposits will be found and future discoveries will be smaller as time goes on. This is because the geological theory, supported by sophisticated survey systems, have already identified the places where oil might accumulate. However, not all of the likely places have been thoroughly explored as yet, especially in the polar regions and under the ice. The graph of “future” discoveries indicated for the period after 2014 is just an extrapolation of a declining curve beginning with the late 1960s when the Middle East and Africa were being thoroughly explored. Based on this extrapolation the costs of oil can be expected to increase (on average) as the best quality reservoirs are depleted. In the case of oil, these must be replaced by supplies from remote areas, deep under the ocean, or from hard-to-refine “unconventional” sources such as tar sands and shale. Conventional wisdom, based on the Hubbert model (Hubbert 1980, Deffeyes 2005) and “official” reserve data as published by IEA , USEIA and BP, yields forecasts as shown in Figure 2 of future production assuming “business as usual” (BAU). According to this picture the peak for all liquids (including natural gas liquids, NGL) should occur around the time of writing, while the peak for natural gas might be between 2030 and 2035 with the peak for coal shortly after that. However these estimates are based simply on curve fitting and cannot be taken too seriously. Of course, new discoveries do occur as exploration continues, and extraction technology does become more efficient as the industry continues to invest. Projections of “peak oil” based on data available twenty years ago have been superseded, thanks to technological progress (e.g. “fracking”)during the interim (Campbell 1997, Campbell and Laherrère 1998). However, it seems that the “legacy” resources that were being exploited twenty years ago have, indeed, reached maximum capacity, and all of the increases in global output since 2005 were accounted for by “unconventional” resources, especially US shale “fracking” – a technology that barely existed in the 1990s. Figure 3, from Jean Laherrere, shows the increasing discrepancy between “official” reserves (based on reports from oil companies) and probable reserves based on discoveries and known rates of production, from technical data. Official reserves were under-estimated for a long time, due to “missing” (under-reporting) of oil fields. But since 1995 or so the situation is reversed, as official reserves are over-counted due to exaggeration of reserves –mainly by Persian Gulf countries– for political reasons, probably to maximize influence within OPEC (Campbell and Laherrère 1998) (Simmons 2004). The crucial fact is that actual reserves in the ground are now probably much less than “official” reserves, which means that “peak oil” is closer than many people think. The economics of supply and demand in an ideal world of free markets and competitive producers would dictate rising prices as the costs of production increase. Higher prices means that a larger fraction of the GDP (or GWP) must be devoted to the search for, extraction and conversion of the resource to a useful form, such as electricity or kinetic energy of motion. Those are “net energy”, or energy surplus available for activities other than digging for coal, drilling for oil and gas, plus conversion into a “final” form. Putting it another way, the cost of exergy (exergy input) to obtain useful work (exergy) output keeps rising, on average, for the reasons explained above. Or, putting it another way, the exergy returns per unit of exergy input (EROI) for purposes of extraction and conversion, keeps declining. Net energy and ROI are tightly linked. See Figure 4. So, there is an obvious link between primary energy sources, power sources and power applications (Cleveland 1992, Cleveland et al. 1984, Gever et al. 1986) (Hall, Cleveland, and Kaufmann 1992). Net energy is the surplus available for doing work in the economy beyond the energy (exergy) requirement for finding and extracting that energy. In the case of fossil fuels that are later used in a combustion process, the process begins with exploration and testing, to determine the quality, the size and the difficulty of extraction. This is followed by mining (or drilling) into a reservoir of some sort that was left by ancient bio-geo-chemical processes. If the resources is a solid (coal or lignite) it will be found in layers (seams) separated by layers of rock. If the resources is a liquid (petroleum) or natural gas dissolved in a liquid, it may be inhomogeneous , with different densities at different pressures. If the resource is actually a solid (e.g. shale) or a very viscous substance (e.g. tar sand) the shape of the reservoir can be determined easily, but the quality and composition can vary from location to location. If the resource is unlimited (sunlight or wind) the procedure is different. The next step for material resources is to determine what process will be needed to separate solid, liquid and gaseous substances and subsequently to separate the liquids and gases (if any) from the solids. This step determines how much exergy will be required just to purify the resource before refining it. These estimates are not standardized, so answers may not be accurate. Then comes the refinery, with capabilities that depend on the utilization of the output, e.g. whether as fuel for a vehicle, feedstock for a chemical process or electricity for the grid. The major purpose of this paper is to point out that EROI for different resources, used for different products, cannot be compared meaningfully. In particular, it is important to understand that EROI for any resource from the ground will decline as exploitation continues, whereas the EROI for renewables are likely to increase with experience and scale. Unfortunately, EROI advocates have confused apples with oranges, in some presentations. The following graph, Figure 5, (which I have cited in several publications without much thought) supposedly compares EROIs for fossil fuels with EROIs for other energy sources, viz. wind, nuclear, photovoltaic, ethanol and biodiesel. I say “supposedly” because the comparison is actually inappropriate and the implications are misleading, as explained in the next section. A misleading implication of Figure 5 is that, to maximize economic surplus, investment should go first into hydro-power, then coal, then oil. Moreover, it implies that faster exploitation of a resource will “use up” that resource, reducing its EROI. This is true for fossil fuels. In fact, it has been argued explicitly that the EROI for petroleum was much higher at the beginning of the 20th century than it is today, precisely because the absolute quantity of the resource left in the ground is, indeed, declining (Hall 2008). N.B. the calculation of exergy return from exergy investment at a given time in history reflects exergy cost of finding, drilling, transportation and refining of the oil from a given field, relative to the exergy content of the refined product, for a given use. Clearly the EROI reflects the efficiency of all of those processes. I argue that it should also reflect the efficiency of the final use. For a given reservoir size, as the efficiency of the exploration, pumping, transport and refining increases, the EROI also increases. The EROI per barrel for the East Texas oil field discovered by “Dad” Joiner and “Doc” Lloyd in 1930 was far greater than for the “Spindletop” field, discovered in 1900, because the usable fraction of the oil (as gasoline) was much higher in 1930 (thanks to “cracking”) while the cost of transportation and refining was far lower. Very little of the oil found in 1900 was converted into gasoline; most of it was sold as a lower value product (kerosene) for lighting. In the case of North Sea or Alaskan oil, the EROI per barrel may be even higher, because the catalytic cracking process used now yields a significantly higher gasoline fraction. On the other hand, coal and most renewables, from nuclear power to wind and solar power, produce electricity, not gasoline. In the case of nuclear power, the resource (uranium) is extremely large but finite. In the case of wind and photovoltaics it is effectively infinite (the sun). The EROI calculation is quite different and incomparable with the case of petroleum. To be sure, electricity from the grid is essentially the same everywhere, but it is not directly comparable with gasoline. The efficiency of thermal power stations driven by steam turbines, is nearly the same for coal-fired power plants and the nuclear power plants now in use around the world, namely around 45% before accounting for transmission losses. However, whereas coal mines are getting deeper, there are compensating marginal improvements in the technology that keep the EROI for coal (per kwh of electricity generated) relatively constant. The case of nuclear power is spectacularly different from the case of fossil hydrocarbons. The current generation of uranium-based nuclear fission plants, utilize the isotope U 235, which must be concentrated by means of gas diffusion or high-speed centrifuges from the main isotope U238. The enriched uranium in solid fuel rods is kept from melting in the reactor core, when the chain reaction is going, by positive cooling or pressurization that consumes some of the electric power output. (It can fail catastrophically, as in Chernobyl and Fukushima) if the power supply to the cooling/pressurizing system is cut. The solid fuel rods need to be removed, replaced and stored after a few years, after a mere 0.2% of the potential energy from uranium fission reactions has been converted into heat and thence used to generate steam. Despite the incredible inefficiency of this scheme the global resource of uranium is adequate for a long time. However high temperature “fast breeder” reactors, long since designed and tested – but not yet adopted – could extend the lifetime of the global uranium supply by a factor of 50 or so (Flocard 2016). An alternative fission technology, starting from “fertile” thorium, could achieve much higher efficiency with a high temperature liquid fuel system while producing no by-product plutonium (and thus reducing the potential for weaponization) (Hargraves 2012). This is not an argument for nuclear power – I have opposed it since the 1960s – but it makes the point that the calculation of EROI as in Figure 5 depends on an underlying assumption that the current state of technology is fixed, or at least close to a long-term limit, which is not the case. The nuclear fusion technology, which still a long-term possibility, would have an even higher EROI. Consider another example, the biofuels, for which EROIs are currently barely about (if not less than) unity. The worst case is ethanol from corn, in the US. It is true that this makes little or no sense from an energy perspective, albeit the availability of by-products (animal feed) makes the economics barely viable. But the situation would change dramatically if cellulosic waste (such as bagasse or corn stover) could be converted to methanol on a large scale. There is enough cellulosic feedstock to supply all the world’s cars, in principle. The technology also exists least on the laboratory scale (Wyman et al. 1993, Olah, Goeppert, and Prakesh 2009). The problem is aggregation and scaling up. This could happen fairly quickly if the price of gasoline rose high enough. The EROI would also rise, albeit not spectacularly, since methanol would be competing with gasoline. What about wind and solar PV? In both cases the resource is effectively unlimited, in the sense that it will not be degraded by exploitation; it cannot be “used up” like the oil or gas in a reservoir. The wind-turbine technology for capturing the kinetic energy of the wind is now quite sophisticated, and future efficiency gains are mainly obtainable from increasing scale, i.e. increasing the size of the turbine units. Some gains may also be achieved by increasing rotational speeds by more sophisticated “feathering” of turbine blades. But the major engineering variables are known, so it is possible to make realistic estimates of the EROI from wind turbines subject to assumptions about wind speeds at different times of year. The fly in the ointment, so to speak, is the fact that wind power is intermittent: the wind does not blow all the time, and it may not be blowing when demand is high. But what if the Solar Power Satellite (SPS) were actually implemented in geo-synchronous orbit, where the sun shines 100% of the time? In that case, the energy could be transmitted back to Earth by microwave beams at frequencies not absorbed by the atmosphere, to ground-based antenna systems (known as “rectennas”). Moreover it would be possible to do most of the manufacturing in orbit, while collecting the bulk of the structural materials from lunar soil, which could be projected into orbit by magnetic “mass drivers” and captured there for use (Criswell and Waldron 1980). Such systems would be more efficient than ground based systems, and after the developmental initial stage they would be self-powered, except for a moderate number of launches from the ground for maintenance and repair of critical elements. There is little doubt that the SPS is technically feasible. The main drawback now is the high cost of lift, by means of conventional single-use rockets. The re-usable vehicles now being tested by Space-X may change this situation. In the more distant future still more radical means of propulsion for lift vehicles are under development. See, for instance, Figure 6. The point I am making is that in the relatively near future, a realistic EROI for solar power might be an order of magnitude (or more) higher than today. Electricity from wind turbines is generally fed into the grid. Wind power is also intermittent. Hence load balancing for the grid, if there were a lot of wind energy, would also require large scale storage, either in hydro reservoirs or reservoirs constructed for the purpose. “Pumped storage” – using temporary surges of surplus power to pump water into a reservoir at a higher level — is usually thought to be the only realistic possibility (and even that is not taken into account in current EROI calculations). If wind turbines were combined with storage units the system EROI would increase dramatically. Moreover, new flow-type batteries and heat-pumps as storage systems that may cut the cost of storage are now under development. See, for example, heat-pump schemes outlined in Figures 7-8. The Isentropic system illustrated in Figure 8 is radically different from existing heat pumps, in that the hot (input) heat is very high temperature (500° C) while the low temperature is around -180 °C, allowing a Carnot efficiency of recovery as high as 90%. The heat storage medium is cheap sand and gravel. Admittedly this scheme (currently being tested) is not yet proven at utility scale. But if it is successful as proposed, it should be significantly cheaper than conventional pumped storage. That would make storage more attractive. Apart from demand-side management, the key to increasing the EROI for intermittent systems is energy storage. In the case of rooftop PV, with local consumption and no grid connection, battery storage already makes sense. The existence of a large potential demand for this has been demonstrated by Tesla, with its “Power Wall”. Households would clearly have to learn to match their maximum uses of power (e.g. for washing and drying dishes or clothes) to periods when the sun is shining. This can easily be automated. None of the above is intended as an argument for solar satellites or a specific energy storage scheme. There are a lot of other technologies potentially available for storage to balance the supply from intermittent sources. They range from heavy rail cars on a hill to high speed flywheels, to compressed air in a cavern, super-capacitors and reversible chemical processes like electrolytic hydrogen. The point is that rapid technological progress can make the EROI’s increase rather than decreasing. This paper makes several points about the use of EROI as an indicator. First, for comparability it is important to limit comparisons to specific end-use a products, such as gasoline for cars or electricity for the grid. Second, it is important to avoid comparing EROIs for fossil fuels stored by nature in the Earth’s crust vs nuclear power (also based on energy from the Earth’s crust) or technologies based on energy from the sun. The EROI for intermittent sources (wind and solar PV) may increase radically in the future, as new energy storage technology is implemented. More generally, it is important to notice that, whereas increasing use of fossil fuels will reduce the EROI of what remains in the ground, the opposite is true for renewables. This is because the renewable technologies are at the beginning of their development, and have yet to enjoy all the benefits of scale and experience. When those benefits are taken into account the EROIs for renewables may be significantly greater than the current EROI for hydrocarbons. Ayres, Robert U. 2016. Energy, complexity and wealth maximization. New York: Springer. Campbell, Colin J. 1997. The coming oil crisis. Brentwood, UK: Multi-Science Publishing and Petroconsultants. Campbell, Colin J., and Jean H. Laherrère. 1998. “The end of cheap oil.” Scientific American 278 (3):60-65. Cleveland, Cutler J. 1992. “Energy quality and energy surplus in the extraction of fossil fuels in the US.” Ecological Economics 6:139-162. Cleveland, Cutler J., Robert Costanza, C. A. S. Hall, and Robert K. Kaufmann. 1984. “Energy and the US economy: A biophysical perspective.” Science 255:890-897. Criswell, David R., and Robert D. Waldron. 1980. “Commercial Prospects for Extraterrestrial Materials.” J. of Contemporary Business 7 (3):153-169. Deffeyes, Kenneth S. 2005. The view from Hubbert’s peak. hardcover ed: Hill and Wang. Flocard, Hubert. 2016. Molten Salt Fast Breeder Technology — An overview. Gever, John, Robert Kaufmann, David Skole, and Charles Vorosmarty. 1986. 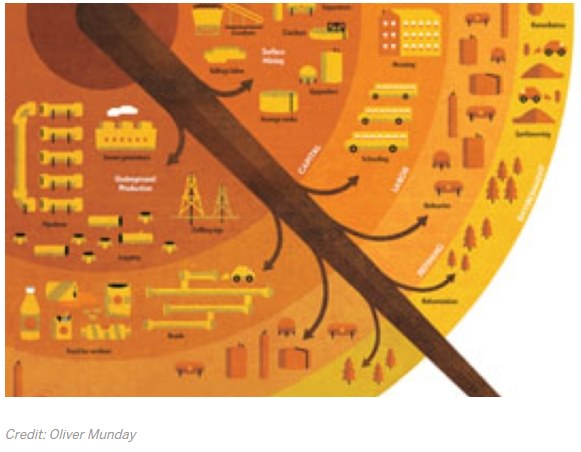 Beyond oil: The threat to food and fuel in the coming decades. Cambridge MA: Ballinger Publishing Company. Hall, Charles A. S. 2008. “Why EROI Matters (part 1 of 6).” The Oil Drum. www.theoildrum.com. Hall, Charles A. S., Cutler J. Cleveland, and Robert K. Kaufmann. 1992. Energy and resource quality: The ecology of the economic process. Niwot CO: University Press of Colorado. Hall, Charles A.S., Jessica Lambert, and Stephen B. Balogh. 2014. “EROI of different fuels and the implications for society.” Energy Policy. Hargraves, Robert. 2012. Thorium: Energy cheaper than coal. Hanover NH: Robert Hargraves. Hubbert, M. King. 1980. “Oil and gas supply modeling; Proceedings of a symposium held at the Department of Commerce.” Symposium at the Department of Commerce, Washington DC, May. Keys, David. 1999. Catastrophe: An investigation into the origins of the modern world. London: Century Books, Random House UK. Murphy, David J., and Charles A. S. Hall. 2010. “EROI, or energy return on (energy) invested.” Annals of the New York Academy of Sciences (1185):102-118. Olah, George A., Alain Goeppert, and G. K. Surya Prakesh. 2009. Beyond oil and gas: The methanol economy. 2nd ed: Wiley-VCH. Simmons, Matthew R. 2004. Twilight in the desert: The coming Saudi oil shock and the world economy. Stern, David, and Astrid Kander. 2012. “The role of energy in the Industrial Revolution and modern economic growth.” The Energy Journal 2012 (3):125-152. Wyman, Charles E. , Richard L. Bain, Norman D. Hinman, and Don J. Stevens. 1993. “Ethanol and methanol from cellulosic biomass.” In Renewable Energy, edited by Johansson et al. Washington DC: Island Press. The term “free” here is used in the normal sense, that no payment is required. The technical meaning in thermodynamics is different but not relevant here. Robert U. Ayres is a physicist and economist, currently Novartis professor emeritus of economics, political science and technology management at INSEAD.. He is also Institute Scholar at the International Institute for Applied Systems Analysis (IIASA) in Austria, and a King’s Professor in Sweden. He has previously taught at Carnegie-Mellon University, and as a visiting Professor at Chalmers Institute of Technology. He is noted for his work on technological forecasting, life cycle assessment, mass-balance accounting, energy efficiency and the role of thermodynamics in economic growth. He originated the concept of “industrial metabolism”, known today as “industrial ecology” with its own journal. He has conducted pioneering studies of materials/energy flows in the global economy. He is author or co-author of 21 books and more than 200 journal articles and book chapters. The most recent books are Energy, Complexity and Wealth Maximization (Springer, 2016), The Bubble Economy (MIT Press, 2014) Crossing the Energy Divide with Edward Ayres (Wharton Press, 2010) and The Economic Growth Engine with Benjamin Warr (Edward Elgar, 2009). This entry was posted in 2016, Economics, Energy and tagged 2016, Energy, Futures, Investment, Latest, Price. Bookmark the permalink.